We have candles ready, but don't think we'll need them after all. Hopefully you and your families are safe! Not sure how I missed it yesterday, but this one takes the cake. I love it! I bet I could make one of these myself. I have a couple oyster projects going that I may post on here one day soon. Clearly I have an obsession with oysters, but I'm okay with that. Another good thing that comes from hurricanes? Good music. I absolutely love bluegrass. Like most music, it comes from the heart and really has a way of showing the emotion of the songwriter. Sarah Jarosz wrote Broussard's Lament after Hurricane Katrina. At the time she was only 14. I had the privilege of seeing her perform at the Cistern Yard as part of this year's Spoleto Festival. That's a night I'd like to do all over again. Great spring weather and a perfect backdrop! Glad everyone safe!Have a great weekend. 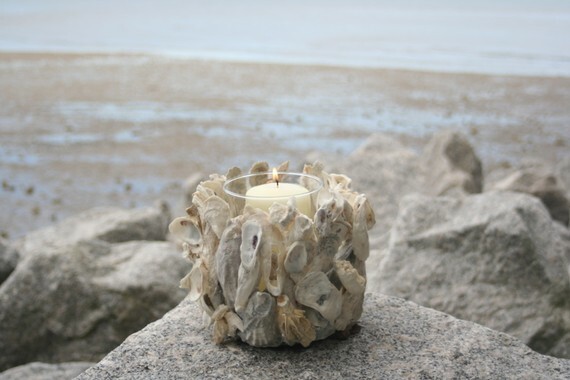 I LOVE that oyster shell candle holder! I want it.